This is the current status of my kitchen. This picture doesn’t show a whole heck of a lot, since I had already done a lot of work. I have finally been able to cook a few dinners. It’s beginning to feel like my kitchen. More pics will come soon once I have it to where I like it. Thank you all for being so patient with me as we continue to unpack. I will be back soon with some very excited recipes. I have a lot of ideas and I am ready to put them together! Homemade bread is simply the best thing ever. There is something so soothing about kneeding the bread and the smell, oh the smell. It’s heaven! I had been searching for a good Italian bread recipe and when I saw this one on Annie’s Eats I knew I found it. I’ve made this bread a handful of times and each time it comes out better. The recipe calls for the bread to be kneaded in the stand mixer for a total of 10 minutes. But I found that once the dough started to come together and was still a little sticky, kneading it by hand was better. I added flour to the dough as I kneaded it so it wouldn’t stick to me or the counter. I think by doing that you don’t over flour it. You need to allow a lot of time for making bread, but the smell of the house and the bread alone is well worth all the work! *You will need to start the process the night before you want to bake it. To make the preferment, combine the water, flour and yeast in a medium bowl. Mix well to blend, cover with plastic wrap, and let sit at room temperature at least 4 hours and up to 16 hours. When you are ready to make the dough, in the bowl of a stand mixer fitted with the paddle attachment, combine the preferment, 4 cups of the flour, dry milk, sugar, salt, yeast, olive oil and water. Mix on low speed until a sticky dough has formed. Switch to the dough hook and add the remaining flour ¼ cup at a time. Continue kneading on low speed until the flour has been incorporated (At this stage is when I’ve taken it out of the bowl and hand kneaded it. You will end up adding more than 5 cups of flour) and you have a dough that is smooth and elastic, and no longer sticky. The total kneading time should be about 10 minutes. Transfer the dough to a well greased bowl, turning once to coat, and cover with plastic wrap. Allow to rise at room temperature until approximately doubled in size, about 2 hours. Punch down the dough, cover once more, and let rise again for 30 minutes. Turn the dough out onto a lightly floured work surface. Knead the dough once or twice and divide into two equal portions. Cover the two pieces of dough with a damp towel and allow to relax for 20 minutes. Shape the two portions of dough into the desired final shape and transfer to a baking sheet lined with parchment or a silicone baking mat . Cover again with a damp kitchen towel and let rise until approximately doubled in bulk, about 1 hour. Preheat the oven to 425˚ F. Just before placing the loaves in the oven, brush or spray them lightly with water. Place in the oven and bake for 20 minutes before rotating them. Bake another 20-30 minutes, or until the internal temperature reaches 200˚ F. Remove from the oven, transfer to a wire cooling rack and let cool at least 30 minutes before slicing and serving. I whipped these up the other night to go with the Chicken Milanese. I love the combination of goat cheese, sun-dried tomatoes and basil. I toasted up the slices of Italian bread and I must tell you the awful truth of that night. I put the slices of bread under the broiler and turned my back. I know better but I couldn’t help myself. I started chopping up the tomatoes while having a nice conversation with my kids. The next thing I knew I was smelling burnt bread. I was able to salvage 8 slices of bread so we could enjoy this wonderful cheese spread. I don’t add any salt to this because the goat cheese and tomatoes have enough salt and any more would be too much. Your tip of the day: DO NOT turn your back on bread you have toasting in the oven! 1. Set rack to top shelf and toast both sides of the bread under the broiler, flipping them over once. When nice and browned take them out and set on plate. 2. With the cut side of the garlic rub it onto the hot bread. You will notice the garlic melts a bit on the toasted bread. 3. Mix together the goat cheese, sun-dried tomatoes, pepper and basil. 4. Spread the cheese mix on the toasted bread and enjoy. I honestly think that iced tea runs through my veins. My husband and I live on it. There is nothing better than freshly brewed iced tea on a hot summer day. When Lipton came out with cold brew tea, the angels sang a beautiful song. Instead of waiting 30 minutes for iced tea; I wait 5 minutes. Twinings realized how wonderful this cold brew tea was and created their own line. It was my beautiful mother-in-law who thought about combining the two different teas. She instantly became my favorite mother-in-law. 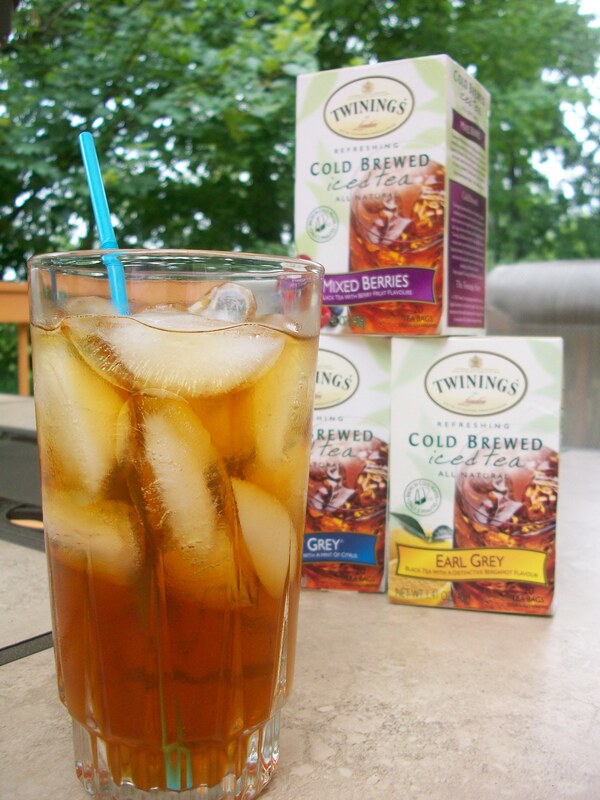 If you love iced tea and want to switch it up a bit; I recommend adding a couple of the different kinds of Twining cold brew tea to your regular tea. My favorite is with mixed berries; reminds me of PF Changs berry tea. Well, there really isn’t a specific recipe. We use a 1 gallon size pitcher and put 3 of the big size Lipton cold brew tea bags in with 2 of the Twining tea bags. A few weeks ago I made an Anniversary cake for my husband’s Aunt and Uncle’s 38th wedding Anniversary. 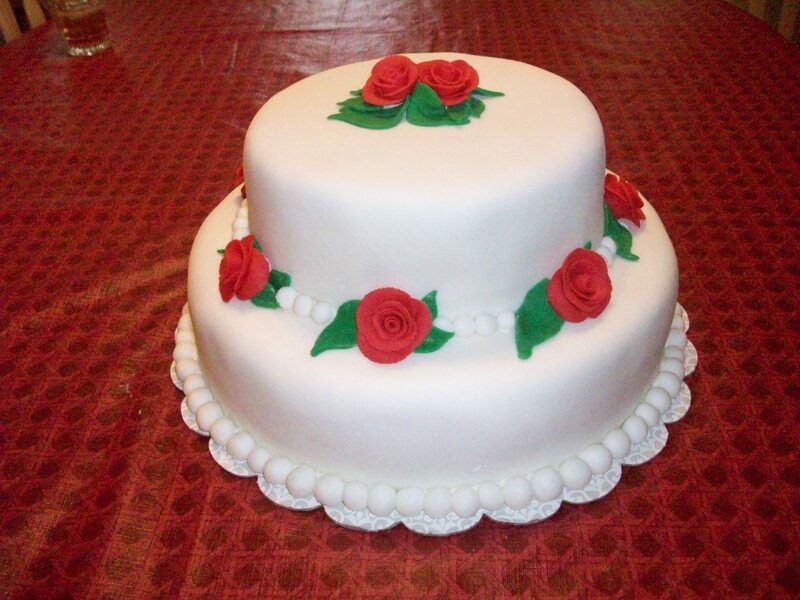 I enjoy making cakes and I’m on the search for the perfect cake recipe. I had a few mishaps when baking this cake. I went to my trusty cookbook Cooks Illustrated thinking it was going to work perfectly. Unfortunately it did not work out like I had hoped. The center of cakes collapsed. Positive note: the cakes tasted really good. I am going to keep on my search for that perfect cake and keep you posted along the way. 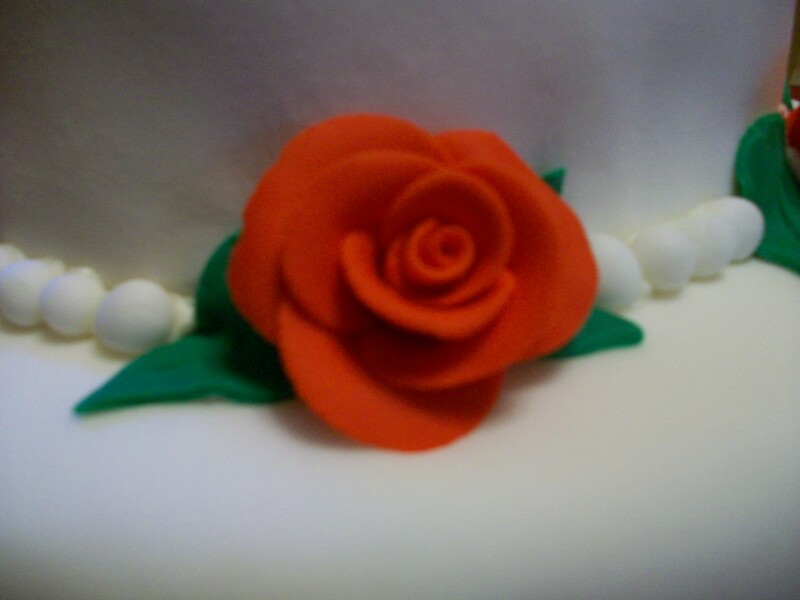 I will also post in the future how to make these beautiful fondant roses. Till then, enjoy the picture.